Attleboro, 72 vs. Dartmouth, 44 – Final – Click here for a recap of this game. Foxboro, 67 vs. Lake Mary Prep (FL), 43 – Final – Foxboro outscored Lake Mary Prep 16-6 in the second quarter to create a 37-24 lead heading into the halftime break and never looked back. Sophomore Brandon Borde scored eight of his 14 points in the opening quarter while senior Joe Morrison had all 11 of his points in the first half. Sophomore Ryan Hughes scored 10 of his career-high 16 points in the final quarter to help secure the win. Franklin, 62 vs. Malden Catholic, 36 – Final – Franklin senior Paul Mahon poured in a game-high 20 points to lead the Panthers past Malden Catholic and into the Somerville Hoop Fest final. The Panthers will play Arlington in the championship on Thursday. Taunton, 77 vs. Charlestown, 67 – Final – Taunton senior Lens Esquil scored a career-high 20 points as the Tigers helped force 30 Charlestown turnovers to advance to the Skip Karam Tournament final. Esquil led the defensive charge with six steals while sophomore Naz Kenion (eight points, three assists) had three steals. Junior Lou Vendrell added 17 points, sophomore Dante Law had 13 points and nine rebounds, and junior John Martins finished with seven points, three rebounds, and three assists. Taunton will play host Durfee in the final on Thursday at 6:30. Attleboro, 46 vs. East Greenwich, 57 – Final – Click here for a photo gallery from this game. Oliver Ames, 42 vs. Needham, 50 – Final – Click here for a recap and photo gallery from this game. Canton, 0 vs. Needham, 0 – Final – In a first-round game of the Joe Donnelly Tournament, Canton and Needham finished scoreless for a tie for MIAA purposes. Needham won the game in overtime to advance to the finals while Canton will play Pembroke in the consolation round. Stoughton, 7 vs. Tri-County, 1 – Final – Stoughton’s offense exploded for seven goals and the defense had its best performance of the season to get the win. Freshman Matt Brown led the offense with a hat trick while Brendan Campbell, Sean Doherty, Mike Nazzaro, and Josh Hough each scored once. Taunton, 4 vs. Dennis-Yarmouth, 2 – Final – Taunton’s Dylan Nichols scored the game-winning goal and had an assist to lead the Tigers to a victory over visiting Dennis-Yarmouth. Mike Albert scored twice while Tanner Lopes found the back of the net once. Cam Sneyd and Will Walsh each chipped in with two assists while Jeremy Chapell and Haden Weyant each had one assist. Sean Bunker made 25 saves to earn the win in net. Canton, 2 vs. Westwood, 1 – Final – Junior Maggie Malloy scored the game-winning goal inside the final five minutes to lift the Bulldogs to a win and into the championship round of the Canton Ice House tournament. Kendra Farrelly scored Canton’s first goal while senior Colleen Kelleher made 35 saves in net to earn the win. Canton will play Milton in the final on Saturday at 4:50. King Philip, 5 vs. Mount St. Charles, 3 – Final – King Philip’s offense got a boost from its blue line as Nicole Connor scored once and had one assist and Jess Daniels found the back of the net once and had three helpers. Olivia Donovan opened the scoring for the Warriors and Ali Wilson scored her second goal in as many games. Boston Holiday Challenge – Mansfield girls indoor track had three top 10 finishes, two by Amanda Mangano. Mangano was fourth overall in the 55-meter dash, clocking in at 7.50 and was seventh overall in the long jump (16’1.25). Madison Haughey ran a PR in the 55M hurdles (9.38) to take ninth overall. Franklin, 3 vs. Newburyport, 2 – Final – Franklin scored a pair of goals over the final 65 seconds to score an improbable win against Newburyport. Trailing 2-1 with just over a minute to play, sophomore Tom Tasker scored to tie the game. Right off the faceoff, senior Jeremy Miller scored the game-winning goal. Senior Luke Downie put the Panthers on the board in the second period. Oliver Ames, 2 @ North Attleboro, 1 – Final – Oliver Ames junior defenseman Matt McCormack scored on the power play with three minutes left to lift Oliver Ames to a non-league win over North Attleboro. Senior Michael Nikiciuk scored Oliver Ames’ first goal as the Tigers held a 31-12 advantage in shots. Stoughton, 2 vs. Norton, 6 – Final – Brendan Campbell and Matt Brown scored third-period goals for the Black Knights. 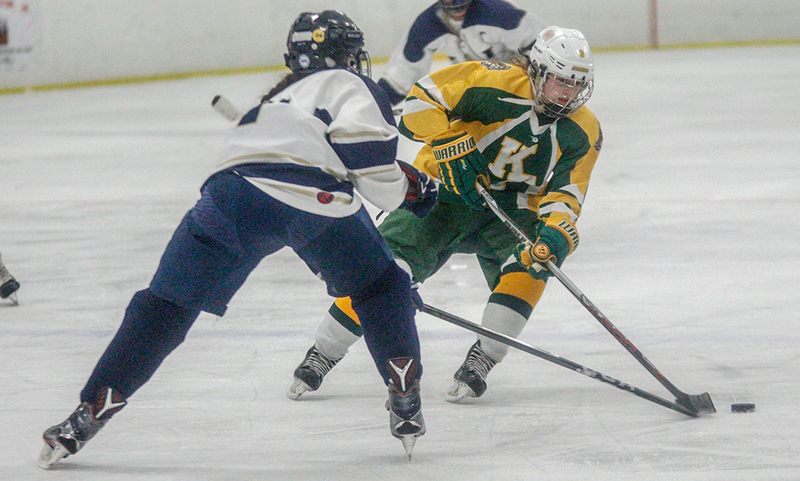 King Philip, 4 @ Dennis-Yarmouth, 2 – Final – King Philip raced out to a 2-0 lead in the first period but the Dolphins battled back with a goal in the first and the second to tie the game. But the Warriors answered quickly as Meghan Gorman put KP back in front with her second goal of the game. Defenseman Nicole Connor carried the puck in from the blue line, evaded multiple DY defenders, and dished a pass to Gorman, who was open in front. Gorman had the opener for KP off an assist from Kyleigh Remmes. Junior Ali Wilson put KP ahead 2-0 while junior Alli Meehan gave the Warriors insurance with a goal in the third period, assisted by Talia Quinn. Defensemen Katie Crowther, Jess Daniels, Marin Cormier, and Madda Kelly kept DY scoring opportunities to a minimum through the second and third periods. Sharon Quad (Sharon, Hingham, Norton, Danvers) – Sharon pinned down a pair of wins at its own quad meet on Saturday morning. The Eagles beat both Hingham (41-36) and Danvers (46-36), but fell to powerhouse Norton (52-15). Senior captains Matt Callan (145) and Sam Mandelbraut (132) each win 3-0 on the day while freshman Jack Landstein (113) earned his first career win. Franklin, 131.75 @ Taunton, 125.25 – Final – Franklin opened its season with a win over Taunton. Junior Mia Lizotte was first in the All-Around with a 36.15, edging out Taunton’s Elise Ferreira (34.1). Lizotte was first in the vault (9.45), bars (8.30), beam (9.20) and floor (9.2). Franklin freshman Lexi Lupien scored an 8.45 on the vault, senior Liz Traphagen scored 8.05 on the bars and 9.1 on the floor, and junior Sadie Rondeau scored 8.40 on the beam for the Panthers. Freshman Katelyn Guidi also placed on the bars.